A heartwarming story of how viral Internet photos can do real world good. You're very familiar with this photo of a chubby-cheeked little boy clenching sand in his fist. The toddler in the so-called "Success" meme is now an 8-year-old boy, named Sammy Griner, who lives in Jacksonville, Florida. Sammy's dad, Justin Griner, needs a kidney transplant, so his mom, Laney Griner, set up a GoFundMe post with the ambitious hope of raising $75,000 for his necessary pre-treatments and transplant. Justin was diagnosed with kidney disease in 2006, and is already undergoing dialysis four hours a day three days a week. While his health insurance will cover 80 percent of the post-surgery costs, he will still need an additional $12,000 to cover his first year of taking anti-rejection drugs, many of which he'll have to be on for the rest of his life. Laney told ABC News that she didn't initially like the photo, which was taken on a beach in 2007 just before Sammy shoved a bunch of sand into his mouth, because the original "I Hate Sandcastles" caption made him look like a bully. But once the photo became the "Success" meme, she appreciated how her son's image morphed into a sign of overcoming obstacles, and now realizes that, in a twist of Internet fate, the popularity of the meme is now helping her own family overcome an enormous hurdle. Just six days in, the fundraiser raised more than $43,000. 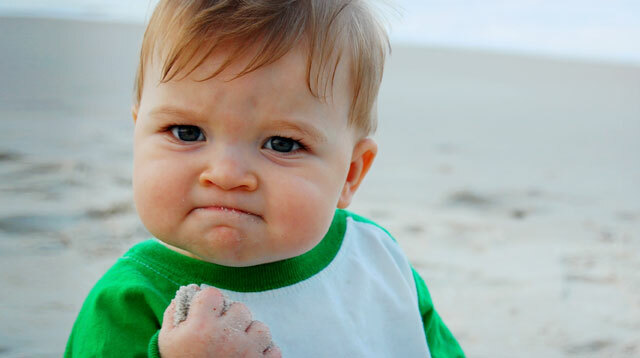 "We're the parents of 'Success Kid' for goodness sake," Laney told The Daily Dot. "If anyone understands the power, the mass, and goodwill of the Internet, it's those of us lucky to experience it daily."